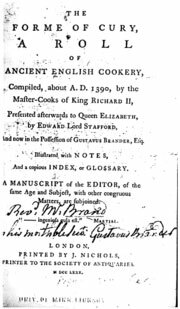 Written by Samuel Pegge and is a cookbook compiled about A.D. 1390, by the Master Cooks of King Richard II. The following are some recipe samples from the book. The recipes are written in Middle English, and they will give you an idea how the recipes looked in the original language.